Spring 2015 Trend Report The best runway beauty looks of the season. Editors get the best beauty advice from the make-up artists and models backstage at fashion week. Thanks to a little help from our friends at New York’s Spring 2015 shows, we present four genius, warm-weather beauty statements. 1. Lips: Hot Lips The spring runways were full of bright spots, from Caroline Herrera, whose models wore socialite-red lacquer to Carmen Mark Valvo, where raspberry lips ruled the day. It convinced us, once and for all, that the best antidote for wintertime blues is a punchy statement lip. 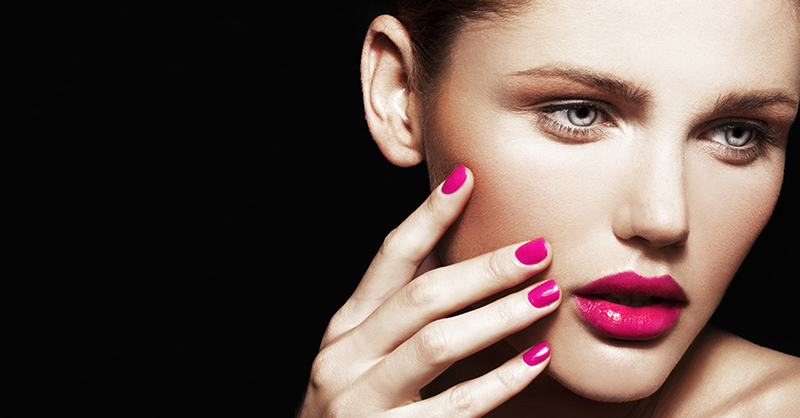 Our pick for a universally flattering shade: fuchsia. That’s right, fuchsia. Proceed gently, with a watermelon lip pencil in a satin finish, or bloom brightly with a full-coverage matte. 2. Eyes: Coloured Eye Liner & Pale Eye Shadow The runways sent out two juxtaposing, but equally interesting, eye trends this season. Dare to go bold with hits of colour on the eyes courtesy of well-placed eyeliner either on the bottom or the top of the lash line, just not on both. Or keep things ethereal with a hit of frost, in beige or white, all over your lids. 3. Contouring: Your glow guide How can you improve on perfection? Backstage at 3.1 Phillip Lim and Alexander Wang, makeup pros used highlighting and contouring techniques to give models sculpted, regal cheekbones and an ethereal glow. To sharpen your features at home, trace a line from cheekbones up to ears using powder in a shade darker than your natural skin tone. Finish with highlights placed down the slimmest part of the nose. Then blend, blend, blend. 4. Nails: Neutrals inspired by nature Nearly neutral fingers turned up on the runways at Rag & Bone, Donna Karan and Michael Kors. Manicurists made earth-tone shades look chic and minimalist by layering stone, putty and cream colours with matte top coats, or base coats applied as topcoats. Follow their lead by applying polishes to freshly buffed nails.